Whether you’ve received the Lord recently or have been a Christian for many years, it’s crucial to realize the secret to living the Christian life. Unfortunately, the spiritual progress of many sincere believers has been frustrated or seriously delayed because of a lack of enlightenment concerning this secret. In this post we’ll consider the secret of the Christian life—living in the mingled spirit, a living of the Lord’s Spirit with our spirit mingled as one spirit (1 Cor. 6:17). First, John 3:6 says, “that which is born of the flesh is the flesh and that which is born of the Spirit is spirit. The Christian life begins with such a birth, the human spirit (the small “s” spirit) being born of the divine Spirit (the big “S” Spirit). If even once in your life you called on the name of the Lord Jesus, praying to receive Him, you possess such a mingled spirit. This is the intrinsic meaning of being “born-again.” It’s not just a conversion to the Christian faith, but the beginning of an organic union of the Lord’s Spirit with your spirit. Second, Romans 8:16 says, “The Spirit Himself witnesses with our spirit that we are children of God.” Once you’ve prayed to receive Christ, believing into His name, you are a child of God (John 1:12). Not only does the clear word of the Bible assure you of this fact, but the Spirit Himself, the Spirit of God, witnesses deep within your spirit, that you are a child of God. Such a witnessing begins from the moment you receive Christ. However, if you do not open your mouth to confess the Lord’s name, you give the Spirit nothing to “witness with.” So do not be a silent Christian, open your mouth and confess, “I am a believer in Christ; Jesus is my Lord. Christ lives in me.” I can guarantee you, according to this verse, that the Spirit will witness with your spirit. Third, John 4:24 says, “God is Spirit, and those who worship Him must worship in spirit and truthfulness.” Once you’ve received the Lord, having God’s Spirit joined to your spirit, you have the proper organ to render God the true worship He’s seeking (John 4:23). The spirit of man, contacting and being mingled with the Spirit of God is the fundamental matter of all true worship and service to God. This is a most crucial lesson for us to apply in all of our Christian living and service. First Corinthians 6:17 says, “But he who is joined to the Lord is one spirit.” So these two spirits become one mingled spirit—the Lord as the Spirit mingled with your spirit. How these two spirits are united together to become one spirit is the deepest mystery in the Bible. So to be a proper Christian, we need to see that the Lord Jesus as the embodiment of the entire Triune God (Col. 2:9) became a life-giving Spirit through the processes of His death and resurrection (1 Cor. 15:45). Now, as the Spirit, He comes to us to indwell our spirit and to be mingled with our spirit to become one spirit with us (2 Cor. 3:17; Rom. 8:9-10; 1 Cor. 6:17). Now that we have seen that such a mingled spirit—the divine Spirit indwelling and mingling with our human spirit is the secret of the Christian life, we need to learn to apply this secret, to live in the mingled spirit, in everything we do. First, to have real fellowship with the Lord we need to be in this mingled spirit—John 4:24; 2 Cor. 13:14; Phil 2:1. Second, to pray to the Lord we must also be in the spirit. We need to practice to exercise our mingled spirit whenever we pray—Eph. 6:18. Third, to receive God’s word we must be in the mingled spirit. We can only receive the life supply contained in God’s word by contacting the Spirit as the essence of the Scripture with our mingled spirit—Eph. 6:17-18; cf. John 6:63. Fourth, to abide in the Lord we need to practice being one spirit with the Lord. That is, we need to remain in our mingled spirit in order to abide in Him—John 15:4-5; 1 Cor. 6:17. Fifth, to serve God in a living, fresh, and acceptable way, we must do it in our mingled spirit—Rom. 1:9; 7:6. Finally, by living in the mingled spirit, we let Christ fill us and saturate us until we are permeated with Him and He is expresses through us—Eph. 3:16-20. By practicing the simple secret of living in the mingled spirit, in the union of God’s Spirit with our spirit, we are one with Him in everything that we do. All of God’s righteous requirements are fulfilled NOT BY us, but IN us. We’re no longer trying to please God. We’re simply one with Him in the mingled spirit and fulfill His requirements spontaneously. What a release! What a secret to the Christian life! This post was inspired by week four of the Thanksgiving Conference on the Focus of the Lord’s Recovery. You can obtain a excellent presentation of this topic in the Holy Word for Morning Revival. You can also read more on this topic in Living in the Spirit by Witness Lee, also available on ministrybooks.org. A fellow blogger has also covered this topic in a similar post at: agodman.com. 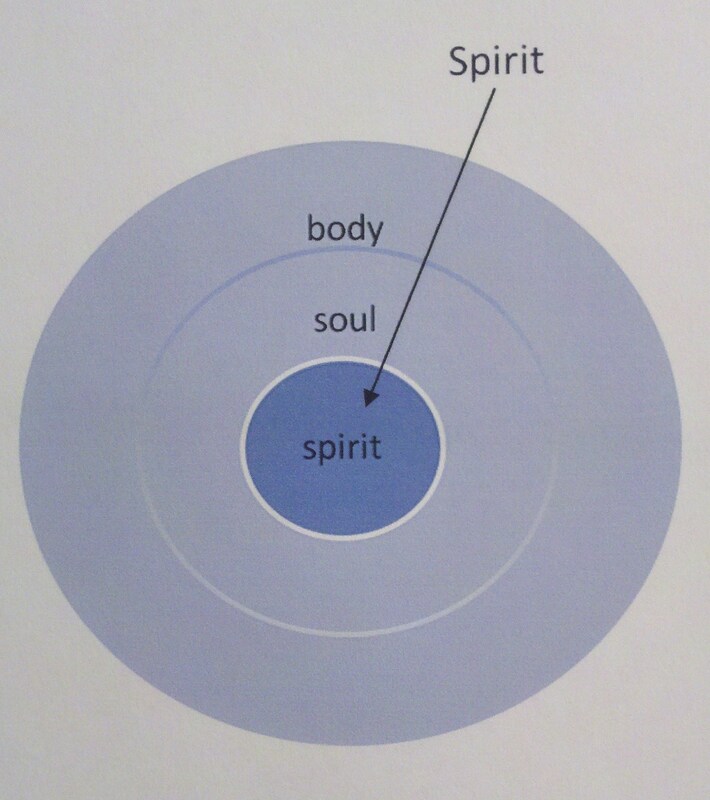 This entry was posted in Christian Experience, Living in the Mingled Spirit, The Focus of the Lord's recovery and tagged mingled spirit, the divine Spirit, the focus of the Lord's recovery, the human spirit, two spirits by thomasmarvin. Bookmark the permalink. I appreciate that the Bible requires one thing of us – to walk according to the mingled spirit. This takes care of the negative and the positive! When we are in the mingled spirit, we are freed from Satan and his authority, and the evil one has no way to touch us. On the positive side, we are brought into the experiences and enjoyment of our Triune God, and can experience Christ being everything to us. How wonderful that living in the mingled spirit fulfills God’s purpose both negatively and positively! It frees us from Satan, and his authority negatively an it brings us us into the experiences and enjoyment of the Triune God and enables us to experience Christ being everything to us, positively. Thanks for such an enlightening comment! This is most encouraging and enlightening. I’m impressed that it all boils down to walking according to our mingled spirit. This is easier said than done, but it’s great to know this key to our Christian walk. May every day be spent learning to walk according to our mingled spirit in oneness with our dear Lord Jesus that the righteous requirement of the law might be fulfilled in – not by – us. He who is joined to the Lord is one spirit. Amen. There is no other way, brother. This really is THE SECRET! Our mingled spirit – the divine Spirit mingled with our human spirit – is the key to our Christian life. The whole Christian life is a life in spirit. We don’t need to strive or struggle to fulfill the law as good Christians or “law-abiding citizens” – we simply need to live and walk according to our mingled spirit. While in spirit, the law is fulfilled in us spontaneously!